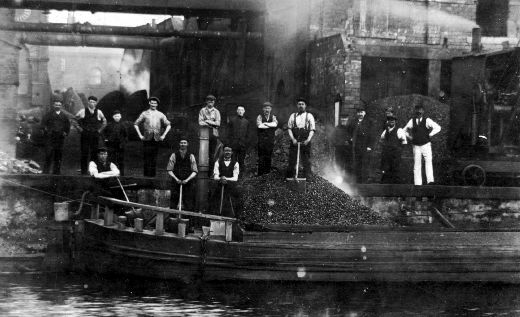 Black and white photograph of 15 men and 1 boy unloading coal for G. and J. Stubley's eight Lancashire boilers. Stubley's were woollen and mungo manufacturer at Calder Mills and Castle Bank Mills in Portobello Road, Wakefield. Joseph Petch (standing on the river Calder, 7th from the left) was scalded to death here in 1930 when a boiler pipe burst. The company then gave a job to his son.